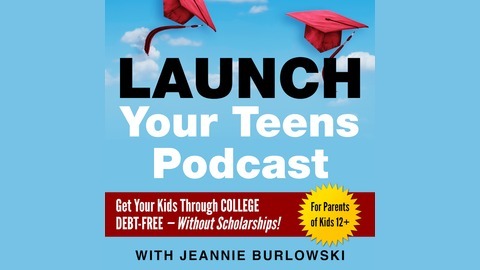 Get your kids through college debt-free—without scholarships! For parents of kids ages 12–26. Learn more at JeannieBurlowski.com. This episode also includes a hilarious idea for making your teen want to go out and get a part-time job. Do you worry that having a job might damage your kid's GPA? Read the helpful, reassuring article I've written on this subject here. Help us spread the word about this podcast! 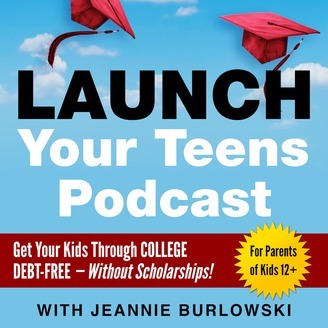 If you’ve got kids ages 12–26, you need to listen to the Launch Your Teens podcast. Lots of help for getting your kids through college debt-free and into jobs they love afterward. Listen or watch here: bit.ly/launchyourteenspodcast. Prefer to read this content? There's a Jeannie Burlowski article on this same subject here. Read Jeannie's article on the hilarious strategy that makes kids want to earn money for themselves here. See Jeannie's favorite quotes from Meg Jay's book The Defining Decade here. See Jeffrey J. Selingo's Washington Post article here. Help us spread the word about this podcast! Please LIKE, SHARE, and SUBSCRIBE on YouTube at bit.ly/launchyourteenspodcast. This episode is sponsored by Signature Orthodontics in St. Paul and White Bear Lake, Minnesota. Online at SignatureSmilesMN.com. Elite Education Leads to a Happier Life. True or False?